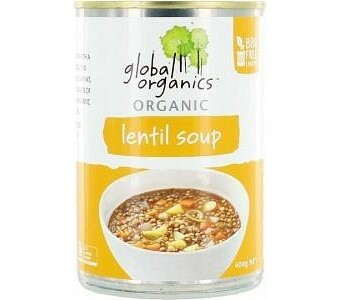 Global Organics Organic Lentil Soup is packed with organically grown vegetables, in a BPA-Free can and free from artificial flavouring. Enjoy it on its own or for an extra wholesome and hearty meal, accompanied by your favourite bread. Ingredients: Water, Lentils (22%), Onions* Potatoes*,Tomato Puree*, Carrots, Leek*, Celeriac*, Maize Starch*, Vegetable Stock* (sea salt, onions*, carrots, leeks*, parnsip*, parsley*, tumeric*, garlic*, nutmeg*, lovage*, pepper*), Red Wine Vinegr*, Sunflower oil*, Guar Gum* (412), Raw Can Sugar*, Sea Salt, Carrot Juice Concentrate*, Garlic*, Lovage, Detrose*. *Organic ingredients.